The skin separated form Vala's dismembered body was transformed into mystic seeds from which originated yellow sapphires. These fell primarily upon the lands crowned by the Himalayas and there formed mines of these wonderfully endowed gems. Sapphires of white or light yellow color are known as pusparaga. Those which are orange are called kauranda. 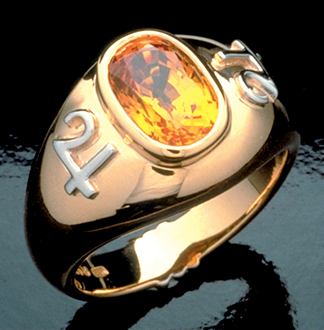 Other auspicious colors are golden yellow, rich yellow and greenish yellow sapphire. Yellow sapphires must be evenly colored, flawless and well shaped in order to be considered auspicious. The value of this gem is the same as a cat's eye of equivalent color and clarity.